DHS allows a grace period of up to 60 days for non-immigrant workers in E-1, E-2, E-3, H1B, H1B1, L-1, O-1, and TN status, if they are laid off due to the circumstances beyond their control. The H1B 60 days grace period means that you will not be considered “out of status” for almost 2 months after your unemployment. This will give you the opportunity to look for other employer or apply for a visa change of status. You get up-to 60 days or until the expiration date of the current I-94, whichever period is shorter. You can use this grace time to file H1B transfer, apply for a change of status or prepare to leave USA. There is no official USCIS form for requesting the grace period. You can file a standard H1B transfer (change of employer or change of status) during the grace period. If you want, you can add a cover letter with your application explaining the lay off situation. But, its not required officially by USCIS. The H4-EAD is attached to valid H4 status, which in turn is dependent on valid H1B status. In 60 day grace period, USCIS allows the H1B worker to maintain the status even if he has lost his job and running no payroll. This means that H4 status also remains valid for those 60 days. Hence, H4-EAD remains valid and H4 EAD spouse can keep working for those 60 days. H1B carry over un-used Grace Period days? The 60 day grace period must be used in one shot. Unused days, if any, cannot be carried over to another grace period. How many times can 60 Grace Period be availed? 60 Grace period single block is only available once per the H1B petition’s validity period. If you lose your job, use the grace period, and then file H1B transfer to get a new H1b sponsored job, you are eligible for using the grace period again, if required. If you resign and rejoin the same employer A after say 45 days of grace period using the same existing H1B petition (no new petition was filed since you re-joined the same employer again), and then later same employer A terminates you, while still on the same H1B approval, you don’t get another 60 days. If an H1B extension had been filed and approved with employer A i.e. a new H1B approval validity period has started, then you are eligible for a new 60 days grace period. Can USCIS deny or cancel Grace period? USCIS can deny the H1B 60 grace period. The USCIS reserves the right to shorten or deny the grace period of an individual on the basis of violation of status, unauthorized employment during the grace period, fraud, or criminal convictions. You can start working with new H1B Transfer employer as soon as you file change of employer petition. The ideal situation would mean that you should have received the USCIS receipt number. Usually, if you send your H1B application by Fedex and USCIS has received it on or before 60th day, you are allowed to start work. 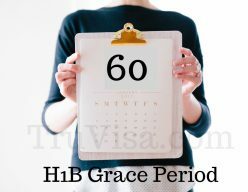 Can I QUIT my H1B job to use 60 day grace period? The official USCIS guidelines does not differentiate between a worker who is terminated and the one who resigns himself. But, they do say H1B job Loss due to circumstances out of control of employee. Hence, we STRONGLY advise against using grace period by planning and resigning from your job. You only get lower of 60 or i94 expiry date as your grace period. In this case, you will only get 28 days as grace period. Travel outside US in 60 day grace period? The whole idea of 60 day grace period is to allow you to stay within USA after loss of employment. If you Travel out of USA, the grace period ends right there. You would need a VALID visa to re-enter USA again. You can start working with new H1B employer even if your H1B transfer was filed on 60th day and you received the receipt number on 60th day. If the petition is going to be filed on 61st day or you will receive the receipt number on 61st day or after, you should ideally go out of USA by your 60th day and plan to re-enter USA. After 60th day, you are automatically considered ‘OUT OF STATUS‘ if you have not yet applied for H1B. H1B Transfer after 60 days grace period – Consular processing? Once you leave USA anytime during 60 day period or after, your H1B transfer application, if not already approved while you were inside USA, will be approved only with consular processing. This means you will have to get the Visa stamped in your passport to re-enter USA. You can use the OLD employer’s visa stamp to re-enter USA if the visa stamp is still valid. But, you should carry the NEW H1B transfer approval notice (i797 notice of approval) to be shown at USA port of entry. On the other hand, we strongly advise to get the new visa stamped in your passport with new approved H1B to avoid issues at immigration counter. H1B grace period start – from the end of employment date or the last pay stub? The grace period will start immediately after the last day of employment – not from the last pay stub/salary day. I have a H1b Visa with company A with client A with validity sep 2020, changed to client B and filed a amendment a got a new 797 with Validity of dec 10 2018 on feb 2019, now my company has asked to stop work from Feb 25 2019, and they are processing under client B for nunc pro tunc Process, i also got a new job with another company , they are also doing h1B transfer process and i got the receipt, can i join the new employer? You can join the new employer on receipt if the new employer if okay with your joining. First of all, thanks for the amazing work and patience in answering all the queries patiently! Kudos! Employer is suggesting to wait for approval to start employment and is silent on my concerns of being out of status by April 19th. Request you to advise if I would indeed be out of status if I do not JOIN the new company by April 19th or the fact that the transfer petition was received well within 60 day period will keep me in-status and legal? Going through your replies on this forum. it appears the former is true but just need your confirmation. You have to join and start payroll to come back to H1B status. If you can’t join on or before 60th day, you should leave USA and wait for result outside. You have been great in answering all the questions. Can you please advise on my situation right now? My employment terminated today with company A. I have an offer letter from company B and they are in the process of applying a transfer (LCA Filed). I am worried what if my company A revokes my H1B even before company B submits my transfer petition. What are my options then? Can i still transfer my H1B in the 60 day grace period? You are fine even if company A revokes your H1B. If you can get a USCIS receipt number and join the new employer on or before 60th day, you are good. 1: If my new employer files for a H1B transfer towards the end of my 60 day grace period and the date of the result of the H1B transfer is after 60 day grace period, in that case, am i protected under the transfer ‘cap’? ie, can i start working with the receipt of the petition? 2: Do I need to tell the legal team of my new company about me being under 60 day grace period? You have to tell your new company about your 60 day grace period as they need to file your H1B transfer quickly to make sure USCIS is able to receive and generate a receipt for your case on or before 60th day. You can start working on receipt. 1: I am close to getting an offer from a company before my 60 days expire. However my passport has 6 months and 6 days remaining. I intend to apply for its renewal asap. Will it be safe to apply for h1b transfer while my passport is in renewal ? 2: Once my h1b has been transferred to my new country, will i need to go out of US and get a stamping? You can apply passport renewal after you have filed your H1B Transfer. You might be required to go out of US if USCIS approves your H1b-transfer with “consular processing”. Normally, USCIS approves with new i94 but if not, then you need to go out. Also in the 60 day validity period, is my I-797 also valid? I797 is only considered valid till the date mentioned on it. Thank you for sharing above information. My friend is with Employer A for last 5+ years. However she is facing lot of political issues due to leadership team changes and she may resign simply because unprofessional work environment. Can she avail 60 day grace period to find new job? Would she have to do any paperwork for USCIS ? Her visa with company A is stamped and expires in July-2019. As mentioned in above article, USCIS may refuse to give the 60 day grace period if you plan to resign and then look for job. In above case , if she resigns , what would be next steps ? Please read the article above. It has all the answers to your questions. What is the difference between Regular payroll and payments via severance payments. To give context my date of separation was March 13. My company’s exit agreements say that my severance payments will be paid to me via the company’s regular payroll system. The specific words are “the Employer’s established pay days via the Employer’s regular payroll system until April 10”. Does this mean that my 60 day grace period starts after April 10? As per my opinion, the official termination date should be taken as the date of start of 60 days grace period. There is no clear guidance from USCIS though. Company does withdraw your H1B once you are terminated. So, USCIS does get the information that your are not on company’s payroll and not working. I have a new job offer but new company is located in another state/city. My visa is already transferred to new company. If I resign from my current company and take a week break to move from one place to other, do I loose 60 day grace period? Meaning, in future if I loose/quit jobs, am I no more eligible for 60 grace period? Do you have suggestions, best way to deal with such a transfer. Move to new state by Airplane. Join the new company and then take any break if you want to. You will lose the 60 day grace as it can only be used once per H1B approval. I was terminated from employer A on Dec 7th and Employer B applied H1 petition on Feb 4th just before the 60 days. Right now i am waiting for approval (got receipt)and haven’t joined company B and my payroll is not running. Can you tell if i am still in status since my petition was filed or should i leave the country? Thanks in advance. Dec 7th of 2018 and Feb 4th of 2019. Also i have another company C consulting who can get a immediate offer and file H1, can i join them on receipt? You should have joined the employer on or before 60th day using your H1B receipt number and started payroll to get back on to H1B status. Not sure why are you waiting for the approval in this case. You are “out of status” if you have not joined the employer and you should leave and wait for result outside USA. Any specific reason you have not joined and decided to wait for approval? How are you maintaining your H1B status currently? Thanks for your prompt response. I was told by the one of the attorneys that it is fine to stay and its legal even if my payroll is not running. Which is false. I was assuming that i am in status as i have petetion submitted. My suggestion for you is to leave immediately as you have already spent over a month in “out of status”. Second step is to upgrade your application to premium. Once transfer is approved, re-enter US. please check this below pdf link page # 32 & 33 section (G). Not sure how it fits in your situation. If you want to take the risk of staying back in US, you can do so if your attorney is fine with it. 1) I will be on payroll with full pay/benefits but will be expected to do no work for them (all access gone) . 2) the last day of employment – frequently referred to as the termination day in the document I got, will be 60 days from the “notice of termination” (=separation) day; at which point I could sign their termination agreement and collect any severance. I have read your FAQs – especially the last one but I am not clear if the grace period has already started for me or if it will start when I get officially terminated. b) They will send a notice of H1B revocation to USCIS 2-4 weeks after the aforementioned 60 days of notice period. It seems that your payroll will run for 60 days? Or it is just the severance pay for those 60 days? As per my understanding, you just have these 60 days to find a new employer and not 60+60 = 120 days if the payroll will not run as usual. Normally, the payroll should keep running to prove valid H1B status. If in your case, the payroll keeps running, then you are probably good for next 120 days. I would suggest to take an opinion from a California based attorney too as they would know state laws better. > It seems that your payroll will run for 60 days? Or it is just the severance pay for those 60 days? Yes, the payroll will keep running for 60 days. The severance comes after that as a lump sum (though whatever they calculate as my severance, per our severance plan, they will deduct the pay they gave me during the 60 days WARN period). Also, the severance is paid only if I sign the termination agreement while pay from payroll for above 60 days is paid nonetheless. Thank you for your insights. Yes, I will also talk to a CA based lawyer to see if there are some quirks..